Chanel Le Vernis Black Pearl and Graphite - do you need them? Swatches! 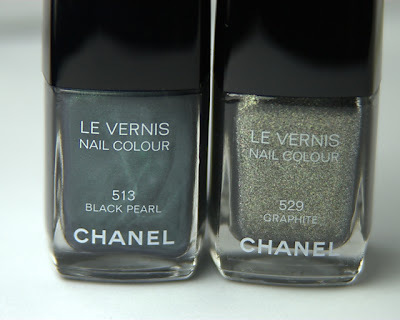 I remember before they launched, when I was just reading descriptions of these polish colours - Black Pearl from the Chanel spring collection and Graphite from the new Chanel fall collection - and thinking at the time that they sounded interesting - but it's not until you see them in person that you realize just how cool they are! Black Pearl - don't be fooled into thinking it's just another grey polish - it's a deep metallic grey with flashes of blue - very fun! Graphite - I'm calling this a sparkly silver with hints of gold - but what's really cool about it is the green flashes - this is definitely not your everyday silver sparkle! So the answer to the question is yes - YES, if you don't already have them then need them - you really do! There, have I convinced you or did you already drink the kool-aid and have them in your collection? Love Black Pearl and wear it all the time!! NEED Graphite!! I have Graphite and I'm not as passionate about it as I am Peridot. I LOVE Peridot! I still need to pick up Black Pearl though! Graphite is so freaking gorgeous!